Charity events for kids teach the vital traits of compassion, generosity and humanity for others. Children must be taught to share. They must be taught to think of others. One of the best ways to teach these traits is to involve children in charitable activities. Community involvement and charity begin at home. Children learn by emulating observed behavior. Teaching children to be charitable requires demonstrating compassionate giving through daily activities, special events and general practice. Charitable activities fan the flames of kindness and spark positive, caring traits in children. Children who are involved in scouting and school programs will become aware of fundraising while they are young, but a parent often tempers the lessons associated with these activities. When it comes to socialized fundraising such as selling cookies, wrapping paper and other items for school and scouting type activities, parents may do the heavy lifting themselves. Kids focus on the rewards associated with how many they sell and not why they are selling them nor what the money raised goes to. It's important for parents to impress upon their children the importance of raising money for a good cause rather than any prizes "earned" by how many objects sold. No matter what age you begin this type of event, it can impress the nature of giving and compassion on your child and his or her friends. The average child has twenty to twenty-five other students in their class. Most birthday parties involve inviting at least one half (if based on gender) to the entire class to a birthday party. The average birthday party for a five year old costs about two hundred dollars between venue, presents, cake and decorations. A charitable birthday party is an alternative to a traditional celebration. 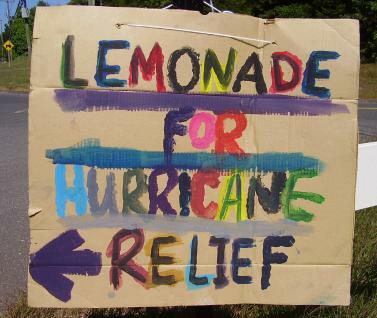 This type of charity event can help a child feel good about helping others. The focus is not on presents brought by other children. Instead, party goers are asked to make donations to a charity chosen by the birthday boy or girl. Those donations may range from gathering canned food for a local shelter to raising much-needed funds for the local zoo. The activities at the party should be geared towards fun activities that support and/or educate about the chosen charity. For example, host a trip to the zoo and ask parents to donate the cost of a "gift" in the name of the child to the zoo. The holidays and the spirit of giving are an ideal opportunity to host a charity events for kids. For example, parents and teachers can take advantage of the Salvation Army's Angel Tree program. Children may take a field trip to an Angel Tree to select a recipient or the school can host a tree. Each child will select an angel from the tree and purchase the designated gift for the angel they have chosen. As part of the event, kids should present their items and read about the child or children they chose from the tree. Giving the recipient a human face much like his or her own is an important aspect of developing compassion. A PTA sponsored school carnival can raise tremendous funds toward a desired goal whether it is a school improvement, helping a family in need or other community assistance. While kids cannot make the technical arrangements of a school carnival, they can work the booths, help with the sale of tickets and even act as heralds to announce events and winners. Carnival types of events take a lot of work, but having children donate an hour of their time to "work" helps them contribute. If a local golf course will contribute time (or negotiate a lower fee) on their course towards a charity fundraising event, a kid-hosted golf tournament can earn a charitable organization or goal a large amount of funds. Kid participants could act as caddies, guides and even help sell refreshments. This type of event would be more geared towards older children and tweenagers rather than elementary school children. In cases where sponsors have been found for different holes on the green, kids may participate as "actors" about the sponsor at each hole and perform a presentation for the entertainment of the guests. Charitable events don't have to raise money, but can should always raise awareness. Community efforts to keep a neighborhood, park or other common area litter free teach children to care for the world beyond their next toy, video game or adventure. Children learn through doing. Child-centric charity events are a solid step on the path to compassionate and giving adults.